Brazos Electric Cooperative Power Plant in Cleburne, TX is a nominal 258 MW combined cycle gas fired power plant operating on AGC (Automatic Generation Control) load requirements. The plant uses approximately 54 million gallons of water per year for boiler feed water and NOx control of its combustion turbine. The power plant was originally commissioned in 1997. 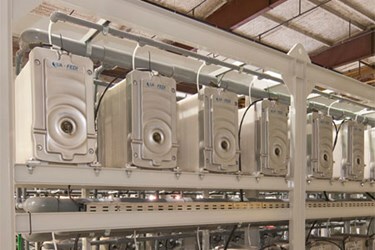 The demineralization plant consisted of a two pass RO unit with inter-pass caustic dosing followed by a conventional polishing EDI unit. Due to frequent scaling, the EDI performance was not stable and did not consistently meet the plants requirements. Shortly after the plant’s commissioning, a rental mixed bed polisher was installed to meet the water quality.